From September to December 1948, the Palais de Chaillot, the emblematic building of the 1937 Exposition Internationale in Paris, hosted the third General Assembly of the United Nations. 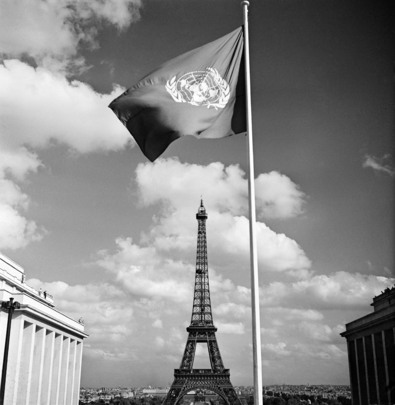 On September 1, the flag of the United Nations was raised to the top of the 25-metre flagpole that had been specially erected on the palace terrace, facing the Eiffel Tower. Chaillot is now an international enclave in the heart of Paris. It was described as a new four-hectare town, or even state, which the press at the time quickly dubbed "Onusie"/ “UN-land”. Two symbols face each other, as the official flag of the United Nations is unfurled from the Palais de Chaillot, opposite the Eiffel Tower.